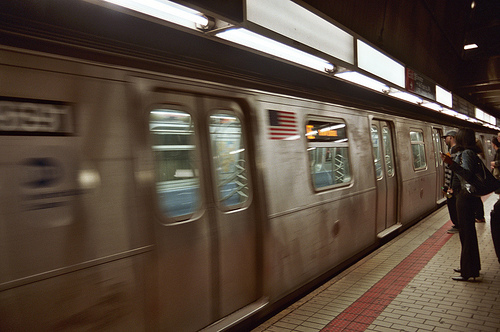 Someone once told me that there’s no experience like riding the New York City Subway. Over 650 miles of tracks snake and slide their way deep under Manhattan, reaching out to four of the five boroughs. It’s impossible to descend the steps into any station and not be instantly overcome by the sensory experience that awaits. The stations are hot and stuffy. The still air is a fragrant tonic of charred street meat, diesel and urine. The noise is deafening as trains rocket in and out of stations, sparking over the rails with an unmistakable squeal. The paint is peeling off steel beams, the overhead lights flicker and buzz and passengers wait like flocks of vultures to squeeze between the doors. On the very last day that Rebecca and I spent in New York City, we traveled across the Brooklyn Bridge one step at a time. While Manhattan is most certainly its own world, crossing the iconic span over the East River felt much like stepping through a portal. As my feet found solid ground in Brooklyn, every little thing I’d long associated with the city’s biggest borough suddenly came to life. It’s the home of the Beastie Boys, of sizzling Italian-American pizzerias, of Coney Island, of century-old brownstones and even the original Dodgers baseball team. When I was younger, my family lived on a cul-de-sac called Brooklyn Place and my school was called Brooklyn Elementary. Naturally, I secretly pretended we lived in Brooklyn. After a couple hours of exploring, the time came to return to Manhattan and we decided to do so by way of the subway. High Street Station was bustling with people on that muggy Friday afternoon. Finding a seat was easier than expected and within minutes our train jolted to life and rattled toward downtown. A group of b-boys kicked their ghetto blaster into high gear and began to break-dance in the middle of the train. Our fellow passengers gave wide berth and kept the dancers moving with cheers and clapping as beat-heavy hip hop sputtered from the well-played speakers. What should have been an uneventful journey from Brooklyn back to midtown turned into a Friday afternoon impromptu train party. Nothing short of something quintessentially Brooklyn, I can’t imagine a more fitting way for New York City to bid us farewell than with the smiles and laughter of 50 of our newest friends… at least for one afternoon. Glad to see a new post about your NY experiences! whens the next trip? I’ll start saving money now and tag along! I agree with VancityAllie…love your writing style! MTA is awesome for roaming musicians. I’ve seen people playing flutes, ukulele, saxophones, steel guitars, steel drums.. you name it. The guys that dance are awesome too. Did any of them do flips that involve grabbing the overhead bars? It’s crazy what some of them can do in such a small space.